Bob Whetstone, professor emeritus at Birmingham-Southern College, came from an environment far, far away from academia. He grew up in a cotton mill village near Alexander City, a childhood that generated this book. Cotton Mary is the life story of Mary Christine Tarley Stone, a young girl growing up with an abusive father, forced into backbreaking labor in the cotton fields and orphaned and pregnant as a young teenager. Life is a roller-coaster ride of exhilarating highs and stomach-aching lows for Mary. The book, beginning in 1932, opens with Mary leaving her gentle aunt’s home. It takes her to work in the cotton mills, to marrying Cliff Stone, a Greek immigrant, and to the birth of their children. Life is often a struggle but eventually they own a small restaurant. Then, Cliff is drafted. He returns from World War II, obviously suffering from post traumatic stress disorder. Even Cliff’s PTSD is somewhat shallowly observed although it is there that Whetstone begins to flesh out Mary’s story. From that point there is a significant maturation in the writing. In the closing pages Mary–now elderly, blinded by glaucoma, and convinced, perhaps with good reason, that her children are indifferent to her plight–begins to contemplate suicide. She sells her car to a black minister and part-time senior citizens van driver for a dollar. She gives away much of her furniture to a family whose home had burned. She makes other last days preparations while putting her late husband’s .22-calibre pistol at easy reach. 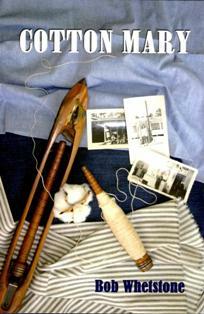 Editor’s note: Proceeds from the sale of Cotton Mary will go to various humanities organizations.